PB & Homemade J – Jay Luker – Really? ... Wow. This one’s been stuck in the Flickr queue for a couple of weeks. Also it wasn’t truly Peanut Butter, but Sunflower Butter. It just seems so awkward to call it a SFB & J. The jelly is grape and was made by my neighbor Leah from Concord grapes growing on a trellis right out her back door. 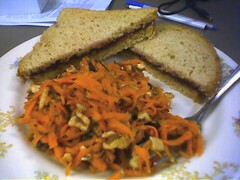 The pile ‘o’ orange in the foreground is some delicious carrot slaw made with honey, walnuts and dried cranberries.